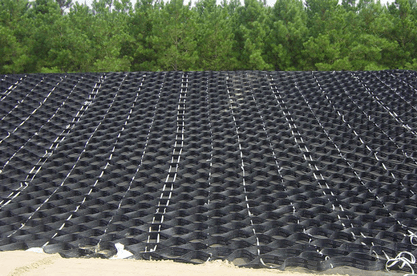 Geo-Cell Cellular Confinement Systems (GCC) are mats produced from High Density Polyethylene (HDPE) and have three dimensional cells that contain, confine and reinforce a variety of fill materials including native fill, topsoil, granular or concrete. This material has excellent UV resistancet and most naturally occurring soil conditions. The mats measure 27.4' x 8.4' and come compressed for transport and are easily handled and installed. 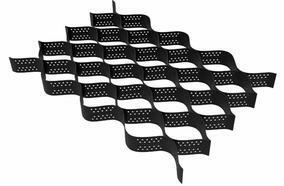 GEO CELL mats can be used on a variety of flat or sloped sites. In many areas, slopes are too steep for simple hydroseeding to be effective. The use of GEO CELLS provides a method to anchor the mulch to the soil to reduce runoff and help vegetation establishment. 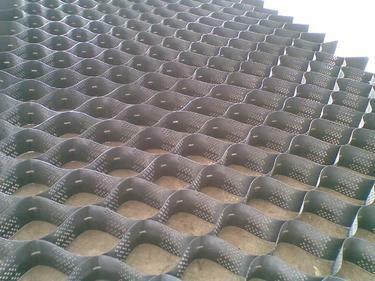 These mats are most effective on steep slopes where the threat of erosion is high. The mats are also effective in areas where the soils are already disturbed and vegetative growth may be slow. Confinement from adjacent cells provides additional resistance against the loaded cell through passive resistance, while lateral expansion of the infill is restricted by high hoop strength. Compaction is maintained by the confinement, resulting in long-term reinforcement. 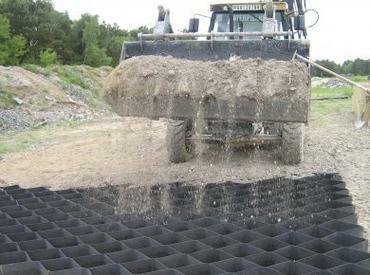 On site, the geocell sections are fastened together and placed directly on the subsoil's surface or on a geotextile filter placed on the subgrade surface and propped open in an accordion-like fashion with an external stretcher assembly. The sections expand to an area of several tens of meters and consist of hundreds of individual cells, depending on the section and cell size. They are then filled with various infill materials, such as soil, sand, aggregate or recycled materials and then compacted using vibratory compactors. Surface layers many be of asphalt or unbound gravel materials. 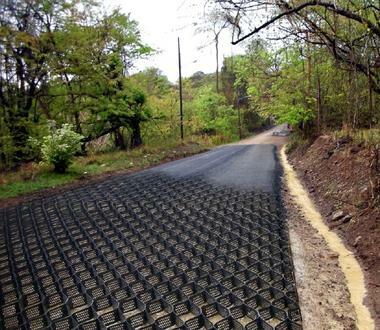 Cellular Confinement Systems (CCS) have been used to improve the performance of both paved and unpaved roads by reinforcing the soil in the subgrade-base interface or within the base course. The effective load distribution of CCS creates a strong, stiff cellular mattress. This 3D mattress reduces vertical differential settlement into soft subgrades, improves shear strength, and enhances load-bearing capacity, while reducing the amount of aggregate material required to extend the service life of roads. As a composite system, cellular confinement strengthens the aggregate infill, thereby simultaneously enabling the use of poorly graded inferior material (e.g. local native soils, quarry waste or recycled materials) for infill as well as reducing the structural support layer thickness. Typical load support applications include reinforcement of base and subbase layers in flexible pavements, including: asphalt pavements; unpaved access, service and haul roads; military roads, railway substructure and ballast confinement; working platforms in intermodal ports; airport runways and aprons, permeable pavements; pipeline road support; green parking facilities and emergency access areas. The three-dimensional lateral confinement of CCS along with anchoring techniques ensures the long-term stability of slopes using vegetated topsoil, aggregate or concrete surfacing (if exposed to severe mechanical and hydraulic pressures). The enhanced drainage, frictional forces and cell-soil-plant interaction of CCS prevents downslope movement and limits the impact of raindrops, channeling and hydraulic shear stresses. The perforations in the 3D cells allow the passage of water, nutrients and soil organisms. This encourages plant growth and root interlock, which further stabilizes the slope and soil mass, and facilitates landscape rehabilitation. Typical applications include: construction cut and fill slopes and stabilization; road and rail embankments; pipeline stabilization and storage facility berms; quarry and mine site restoration; channel and coastline structures. They can be built as an underlying mass or as a facing. CCS provide steep vertical mechanically stabilized earth structures (either gravity or reinforced walls) for steep faces, walls and irregular topography. Construction of CCS earth retention is simiplified as each layer is structurally sound thereby providing access for equipment and workers, while eliminating the need for concrete formwork and curing. Local soil can be used for infill when suitable and granular, while the outer faces enable a green or tan fascia of the horizontal terraces/rows utilizing topsoil. Walls also can be used for lining channels and in cases of high flow, it is required that the outer cells contain concrete or cementious slurry infill. CCS have been used to reinforce soft or uneven soil foundations for large area footings, for retaining wall strip footings, for load sharing of covers over pipelines and other geotechnical applications. WEIRS. Gabion weirs, drop structures, and check dams are constructed across water courses as grade control structures, energy dissipaters, sediment collectors, as well as to form reservoirs, for water irrigation, and water supply in general. Gabion weirs are normally provided with a gabion mattress scour protection apron both on their downstream side and at the upstream approach zone. The weir's crest or crown is always protected with a thin layer of concrete for abrasion protection of the gabion top. REVETMENTS. 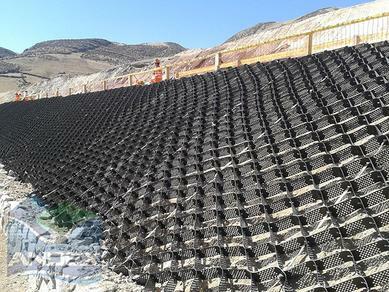 Gabions are well suited as a protective covering on slopes, river banks, channels, etc., to prevent erosion and stabilize. Gabions will withstand alternative tension and compression without losing their structural integrity and permeability. FLEXIBLE APRONS. 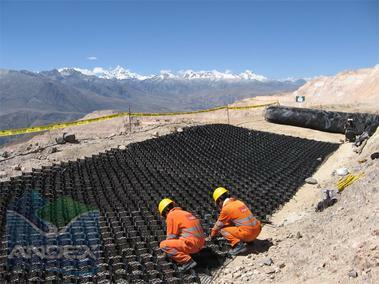 Gabions mattresses are commonly used to protect superstructures against the undermining action of river or sea water. Gabion mattresses will closely follow the changing contours of the bed as scouring progresses, until eventually the erosion is completely sealed off. Conventional noncompliant structures necessitate deep foundations extending well below the maximum scour level and offer protection from settlement of the river or sea bed which might otherwise ultimately lead to their partial or total collapse. COASTAL AND BEACH PROTECTION. Gabions and gabion mattresses offer excellent protection from wave action by dissipating the energy of impact. 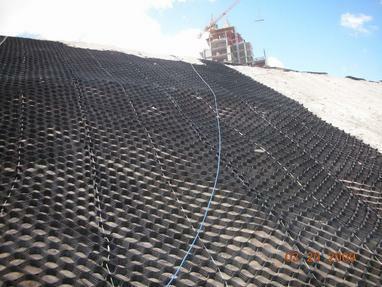 They are superior to rip rap because the highly corrosion resistant wire mesh prevents rock displacement while allowing conformation to changing grade. MECHANICALLY STABILIZED EARTH WALLS. 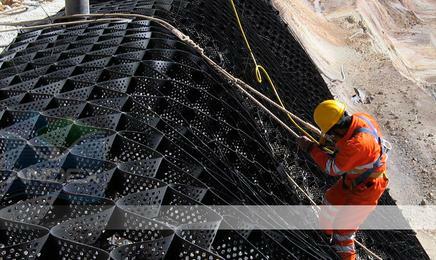 Gabions used in conjunction with the Anchor Mesh technology allows rapid construction of large gabion faced MSE walls. The Anchor Mesh Systems extends the gabion’s top and bottom panels into the back fill to form a continuous load bearing plane from the outer gabion surface deep into the wall for super stability, strength and durability. CCS provides membrane liner protection, while creating stable soil, berms and slopes, for non-slip protection and durable impoundment of liquids and waste. Infill treatment depends on the contained materials: concrete for ponds and reservoirs; gravel for landfill drainage and leachates, vegetated infill for landscape rehabilitation. Concrete work is efficient and controlled as CCS functions as ready-made forms; CCS with concrete forms a flexible slab that accommodates minor subgrade movement and prevents cracking. In medium and low flow-velocities, CCS with geomembranes and gravel cover can be used to create impermeable channels, thereby eliminating the need for concrete. CCS is a green solution that makes civil infrastructure projects more sustainable. In load support applications, by reducing the amount and type of infill needed to reinforce soil, the usage of haul and earthmoving equipment is reduced. This in turn decreases fuel use, pollution and the carbon footprint, and at the same time minimizes on-site disruption from dust, erosion and runoff. When used for slope applications, perforated CCS provides excellent soil protection, water drainage and growth stratum for plants. The long-term design life of advanced CCS technology means that maintenance and the associated environmental costs are significantly reduced, as are long-term economic costs. CCS strip widths, hence the on-site height, come in various sizes from 50 to 300 mm. CCS walls are usually made from textured or structured polymer sheet so as to increase frictional resistance against the infill soil from displacement. CCS are made of HDPE, NPA, low-density polyethylene and nonwoven heat-bonded geotextiles. CCS walls are typically perforated so as to allow for drainage from one cell to another. On steep slopes CCS may have a tendon or cable extending through the central region up the slope and anchored to, or within, a concrete plinth so as to resist downgradient sliding of the system. The backfilling of CCS on long and wide slopes is quite labor-intensive. Construction equipment called pneumatic sand-slingers or stone-slingers have been used advantageously.